Combining rice with broccoli and cheese in a casserole goes back many generations. 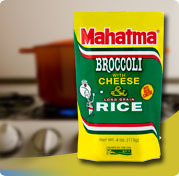 The Mahatma Broccoli and Cheese Rice Mix makes it easy for you to make this all time favorite classic dish by combining all the ingredients. In addition to using real Cheddar cheese and butter, the dish also uses a mild onion flavor and other seasonings for the perfect comfort food. Mahatma makes it easy to re-discover this family favorite. Bring 1-3/4 cups of water and 2 tablespoons margarine to a boil in a medium saucepan. Stir in rice mix, cover, reduce heat and simmer for 20 minutes. Remove from heat and let stand 5 minutes. Stir before serving. In a 1-1/2 quart microwave safe dish, combine 1-3/4 cups hot water, 2 tablespoons margarine, and rice mix. Cover and microwave on HIGH for 3 minutes. Reduce setting to 50% power and microwave for 17 minutes. Let stand for 5 minutes. Stir before serving. If your microwave does not have variable power settings, follow manufacturers directions. As an additional serving suggestion for a Broccoli Cheese soup, prepare rice mix as directed, substitute chicken broth for water. After cooking, stir in 2 cups milk and 4oz pasteurized processed cheese. Heat and serve. Enriched Long Grain Rice [rice, niacin, iron (ferric orthophosphate), thiamin (thiamin mononitrate), folic acid], Broccoli & Cheese Seasoning [Whey, Corn Oil, Monosodium Glutamate, Modified Corn Starch, Salt, Cheddar Cheese (Pasteurized Milk, Cheese Cultures, Salt, Enzymes), Nonfat Milk, Autolyzed Yeast Extract, Dried Onion, Corn Syrup Solids, Butter (Cream, Salt), Sodium Hexametaphosphate, Maltodextrin, Natural Flavors, Sugar, Dried Parsley, Buttermilk, Rendered Chicken Fat, Disodium Phosphate, Sodium Caseinate, Annatto Extract (color), Hydrolyzed Soy Protein, Mono and Diglycerides, Turmeric Extract (color), Citric Acid, Spice Extract], Dehydrated Broccoli. Contains Milk, Soy.